This past January when I was in Israel, my newly wed nephew's wife baked this cake. Four roulades to be exact. See top left photo in the collage below. A bubbly and intelligent gal, I think barely twenty, if that. I was beside myself, taken by her, I had no clue what to expect. We briefly spoke to her at her and my nephew's wedding over the summer, but didn't know her at all. She brought one chocolate roulade over to my sister's home, where I was staying part of the time. We devoured it. One roulade she gave to her neighbor and two she froze for my nephew. I begged her the next day to bring another one over, but she wouldn't relent, it was saved for her sweetheart. When I pointed at her. and told her that she is frugal, she threatened to withhold the recipe from me. All in good fun. Come to think if it, this roulade is a staple at many Israeli homes, baked usually as a Shabbat (Sabbath) dessert. 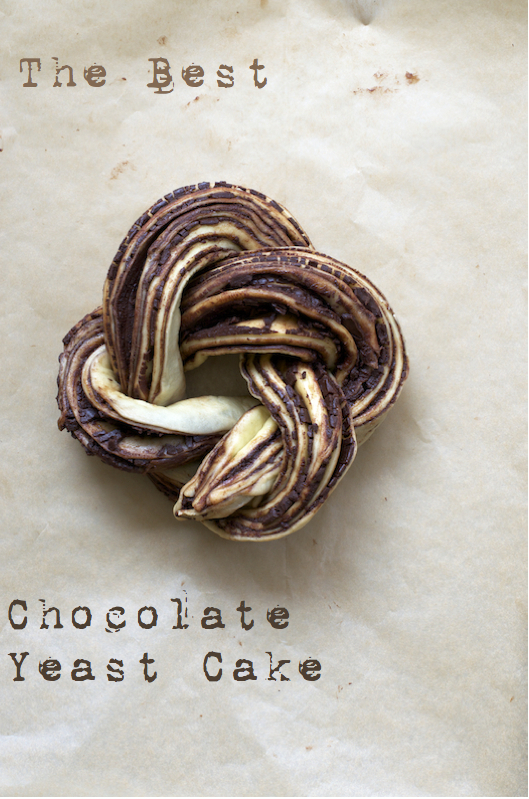 Some would say it is identical to a chocolate babka. Either way, I have been daydreaming about it since I came back to the US, but just got around to baking it. The first two loaves I baked were filled with the cocoa, coffee filling. I cut them lengthwise the way the collage shows, braided and scooped and squished them into two cake loaf pans. They looked like babkas. You might have caught the slice I Instagrammed earlier. The third loaf was the one featured in this post with the semi sweet chocolate filling, it went to my neighbors. The last was a roulade, shown in the top left photo of the collage, filled with the cocoa, coffee filling and sprinkled with sesame seeds. 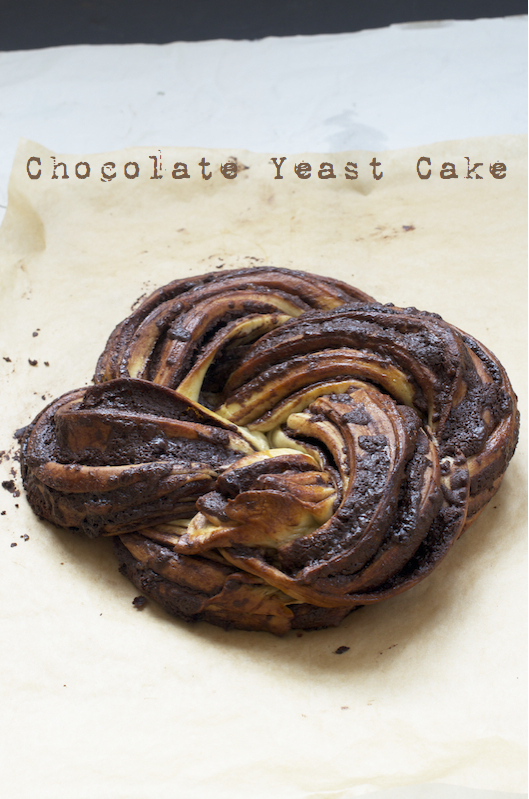 I love that yeast, chocolate and sesame combination. My further research was turning up identical recipes one after the other. I guess the recipe is full proof! After kneading the dough it comes out a tad sticky, but after proofing for two hours, boy it's gorgeous! If you do not wish to bake all four loaves in one day, you can keep half of the dough covered with saran wrap to proof overnight in the refrigerator. Check out my Breads and Anything Yeast board on Pinterest to see the posts that inspired me to shape this loaf in an Estonian Kringle fashion. Mix the milk and egg together. Add the yeast to the 1/2 cup of milk and let rest for 10-20 minutes until the yeast bubbles. Meanwhile, add the flour, sugar and salt into the mixer bowl and incorporate with a rubber spatula. With a dough hook attachment mix into the flour mixture, the milk and eggs, incorporate and shortly after add the bubbled yeast. While the dough is kneading add the pieces of butter one by one. Knead for about 5-7 minutes until all the ingredients are incorporated. Place the dough in a large glass, ceramic or porcelain bowl, cover with saran wrap and let proof in a warm place for up to 2 hours. Divide the dough to 4 equal parts. Keep 3 parts covered with saran wrap while rolling out the first part. Roll out the dough into a super thin 40cmX45cm (a tad larger than 15X17inches) rectangle. Spread with a rubber spatula the semi sweet chocolate filling or brush with melted butter and sprinkle the cocoa, coffee filing and roll tightly from the narrow part into a roulade. Place the roulade on a greased parchment paper lined cookie sheet, with the seam side facing the bottom, cover with a kitchen towel and let proof in a warm place for up to an hour. Brush with the egg wash, sprinkle with sesame seeds if desired and bake in a preheated 180C (356F) oven for 25 minutes. You can slice the roulade lengthwise and keep the sliced parts facing up. Braid while all the while keeping the sliced parts facing up. Pinch ends and turn into a ring. Place on a greased parchment paper lined cookie sheet, cover with a kitchen towel and proof in a warm place for up to an hour. Brush with an egg wash and bake in a preheated 180C (356F) oven for 25 minutes. 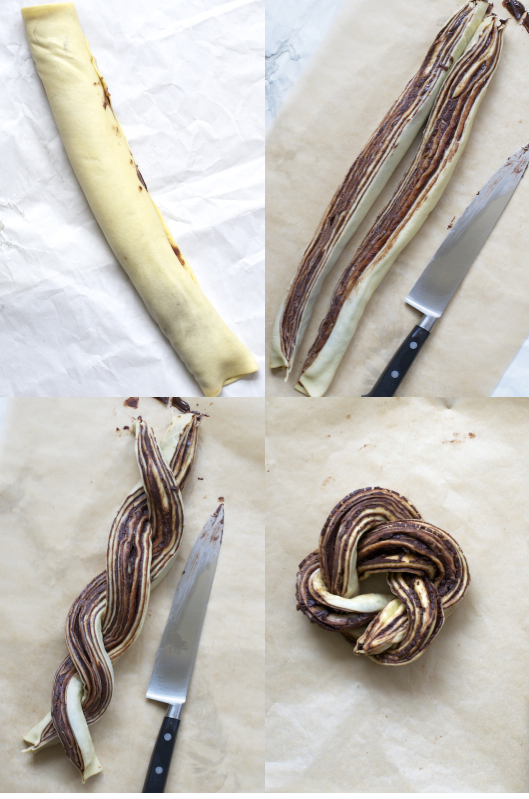 Instead of rolling the braid into a ring you can lift it and squish it like an accordion into a greased parchment paper lined cake loaf pan. Cover with a kitchen towel and let proof in a warm place for up to an hour. Brush with an egg wash and bake in a preheated 180C (356F) oven for 25 minutes. It is easier to squish the loaf with the cocoa and coffee filling into an accordion than it is with the semi sweet spread. Mix the sugar cocoa and coffee. Melt the chocolate and butter in a bain-marie while occasionally stirring with a rubber spatula, until smooth and glossy. Let cool at room temperature. You can use a ready made spread of your choice. Looks like a piece of art! So gorgeous, Shulie! I think it would be dangerous to have one of these around my kitchen ;). TY Rosa. Let me know when you do. What a stunning loaf. If it taste half as good as it looks I would be in serious danger of overdosing on Chocolate Bread. Thanks for a truly beautiful post. I make a similar bread but in loaf form too, and with almond filling. The roulade is stunning Shulie! And your pinterest yeast and color boards too. I must try this chocolate coffee filling, one of my favorite combinations ever. Ooh Paula I will hop to your site in the hopes you posted it. Sounds delicious. My pleasure. I absolutely love it. Wow Shulie, just WOW! Incredible recipe and how I wish I had a piece right now. This really is something I need to make. GORGEOUS! TY Kate. Let me know when you do. I will be making this for a party on Friday. What a wonderful recipe and what wonderful words to go along with it. I wish I could have met her (and had a bite of this!) Thank you for sharing! I'm not sure if you got my last comment...but my word, this bread is just beautiful! Thank you! Aww Kiran. Sweet of you. :) You can definitely recreate pastry shop delights in your own kitchen. Just gorgeous! I have pinned this, I really want to find the time to make it. Thanks so much for posting, photos are stunning. TY Wendy. Just like your jams! :) Thx for pinning! Oh my gosh, this is flipping amazing. I can't get over how pretty this is. This is really just gorgeous! Wish I could sink my teeth into one right now! ahahah I will trade you for one of your creations or you rmomma's spatzle! This looks almost too pretty to eat! This is the most amazing dough recipe I have seen, It looks so beautiful and delicious at the same time. I have pinned it and hope to make it soon. Your breads are gorgeous, Shulie! It looks delicious! Do you freeze it before you bake it or after? This looks delicious and I can't wait to try it. Do you freeze before or after baking? Denise, I freeze after baking and bringing to room temperature. This reminds me I should bake one this Friday. I would bet if it's being prepared for Shabbat the recipe does not likely have milk/butter in it. Pareve recipe somewhere?